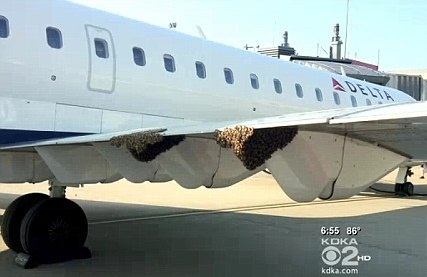 A Delta flight from Pittsburgh to New York was delayed on Wednesday after tens of thousands of bees descended on the plane's wing. The commuter flight loaded with passengers was about to take off from Pittsburgh International Airport when the swarm settled on the aircraft. A local beekeeper had to be called in to collect the insects. 'They were getting ready to fuel and they came around the corner of the plane and right there on the wing is a cluster of honeybees,' Master beekeeper Stephen Repasky of Meadow Sweet Apiaries told CBS pittsburgh. Mr Repasky said bees were a common occurrence at the airport, which he suspects has a colony living somewhere on the premises. At least four swarms have already been caught terrorising planes and airport equipment this year. 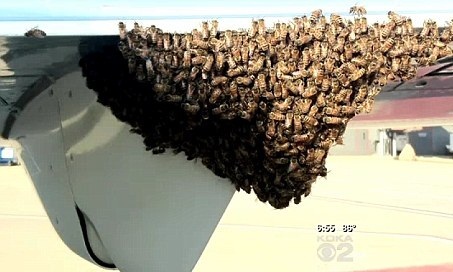 In May, around 30,000 bees landed on the Taxiway-C light, according to CBS. As honeybees are a protected species, they can't be killed so Mr Repasky took them home in a box and will release them at a later date. He said when bee colonies grow too large, the queen takes off with half of the bees in search of a new home. 'So it could be a tree 40-feet up, it could be the wing of a jet liner,' Mr Repasky said.